Download "Medicare Issues in Workers Compensation Settlements PRESENTED BY: MICHELLE A. ALLAN, ESQ." 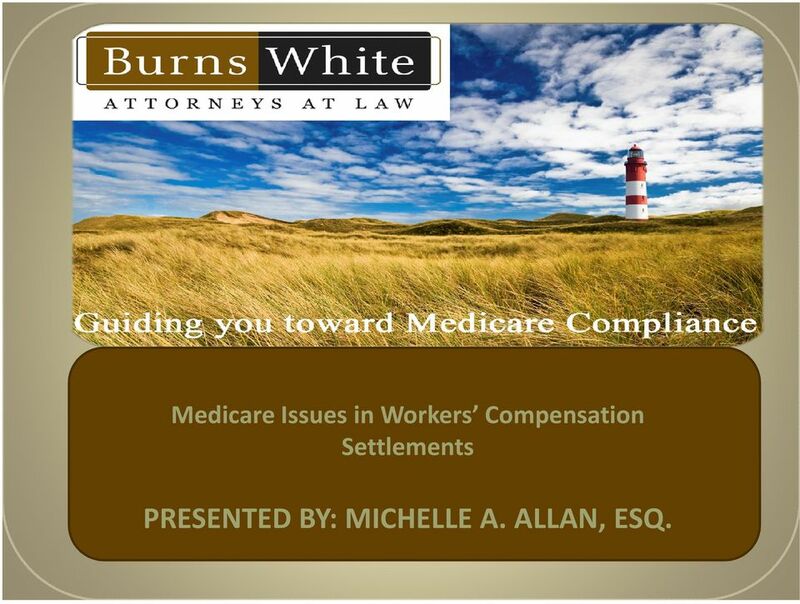 1 Medicare Issues in Workers Compensation Settlements PRESENTED BY: MICHELLE A. ALLAN, ESQ. 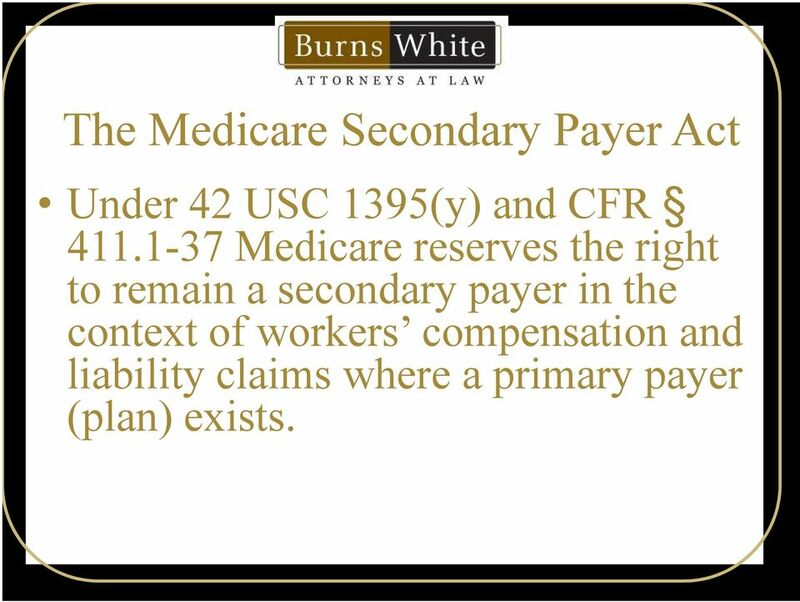 3 The Medicare Secondary Payer Act Under 42 USC 1395(y) and CFR Medicare reserves the right to remain a secondary payer in the context of workers compensation and liability claims where a primary payer (plan) exists. 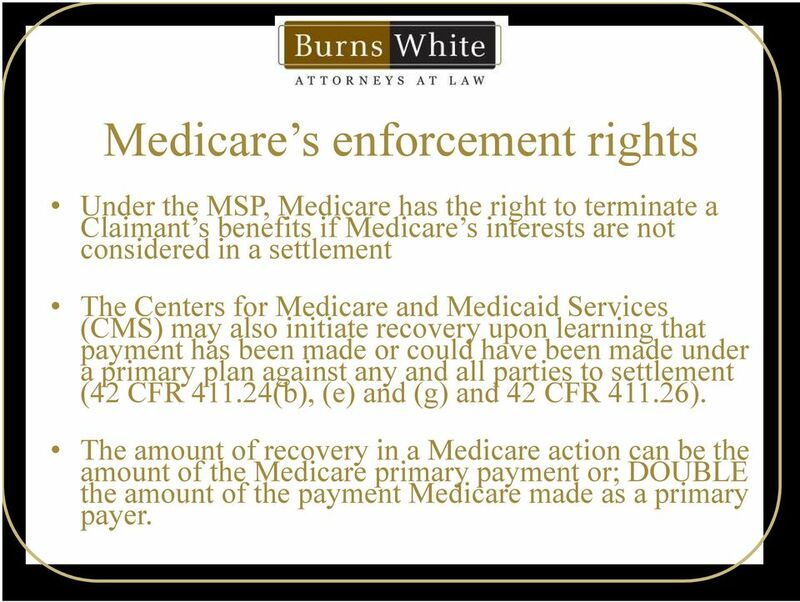 5 Medicare s enforcement rights Under the MSP, Medicare has the right to terminate a Claimant s benefits if Medicare s interests are not considered in a settlement The Centers for Medicare and Medicaid Services (CMS) may also initiate recovery upon learning that payment has been made or could have been made under a primary plan against any and all parties to settlement (42 CFR (b), (e) and (g) and 42 CFR ). The amount of recovery in a Medicare action can be the amount of the Medicare primary payment or; DOUBLE the amount of the payment Medicare made as a primary payer. 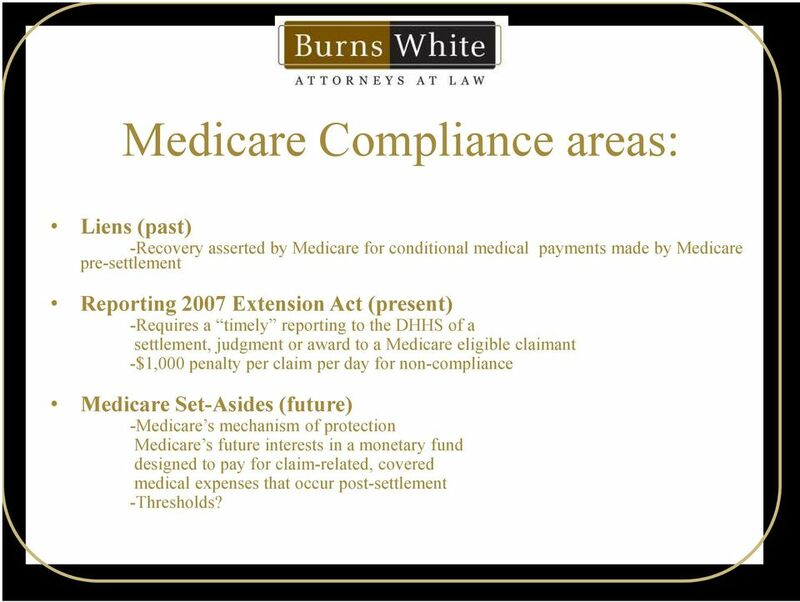 6 Medicare Compliance areas: Liens (past) -Recovery asserted by Medicare for conditional medical payments made by Medicare pre-settlement Reporting 2007 Extension Act (present) -Requires a timely reporting to the DHHS of a settlement, judgment or award to a Medicare eligible claimant -$1,000 penalty per claim per day for non-compliance Medicare Set-Asides (future) -Medicare s mechanism of protection Medicare s future interests in a monetary fund designed to pay for claim-related, covered medical expenses that occur post-settlement -Thresholds? 7 Addressing Medicare liens Pursuant to the MSP all parties to the settlement are potentially liable to Medicare for pre-settlement medical payments made by Medicare for a Claimant s claim-related treatment To protect Medicare s statutory rights and the parties from liability, a lien inquiry should be made to determine whether any Medicare conditional payments have been made and need to be repaid. 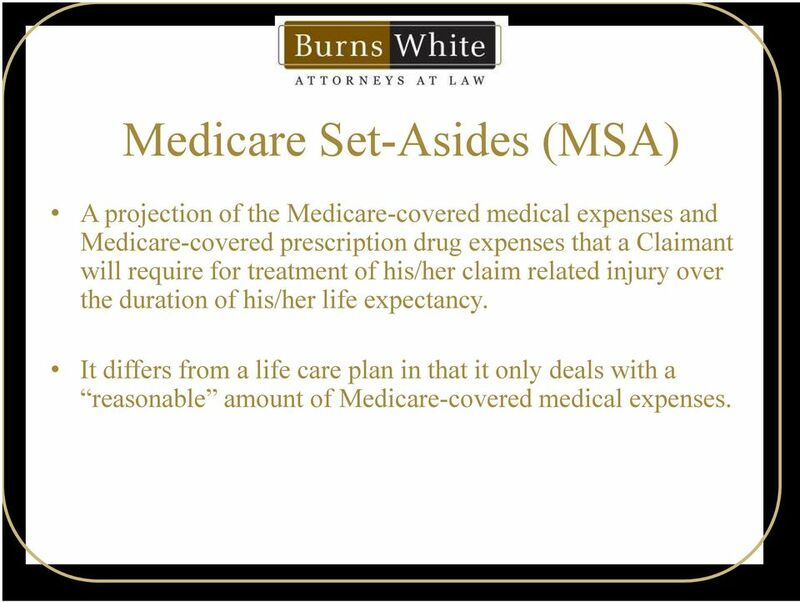 10 Medicare Set-Asides (MSA) A projection of the Medicare-covered medical expenses and Medicare-covered prescription drug expenses that a Claimant will require for treatment of his/her claim related injury over the duration of his/her life expectancy. It differs from a life care plan in that it only deals with a reasonable amount of Medicare-covered medical expenses. 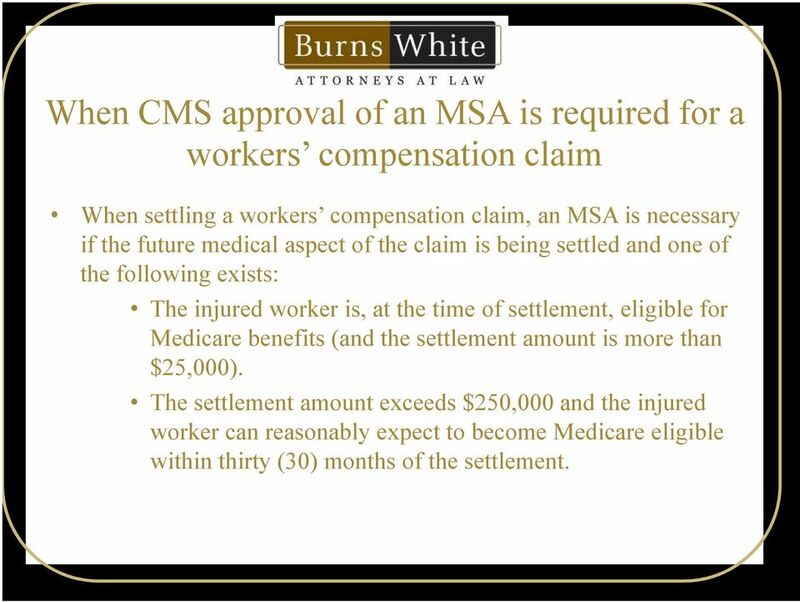 12 When CMS approval of an MSA is required for a workers compensation claim When settling a workers compensation claim, an MSA is necessary if the future medical aspect of the claim is being settled and one of the following exists: The injured worker is, at the time of settlement, eligible for Medicare benefits (and the settlement amount is more than $25,000). 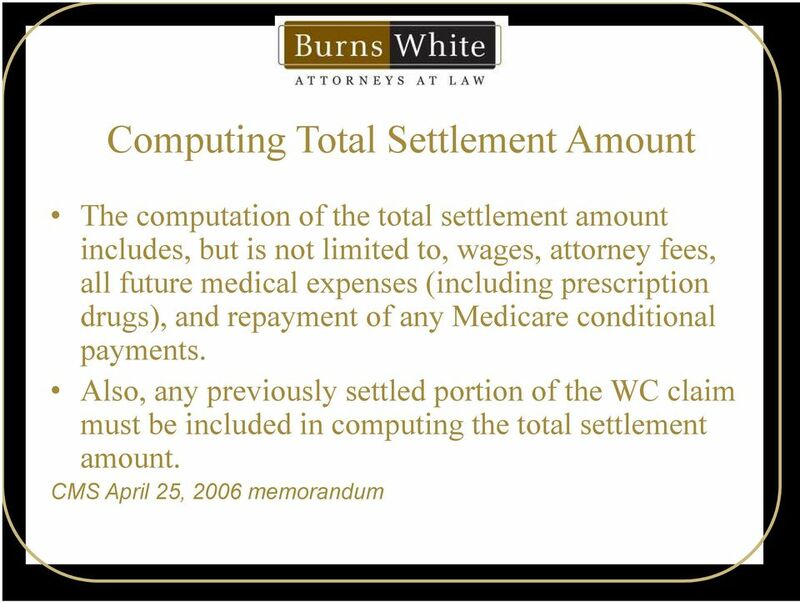 The settlement amount exceeds $250,000 and the injured worker can reasonably expect to become Medicare eligible within thirty (30) months of the settlement. 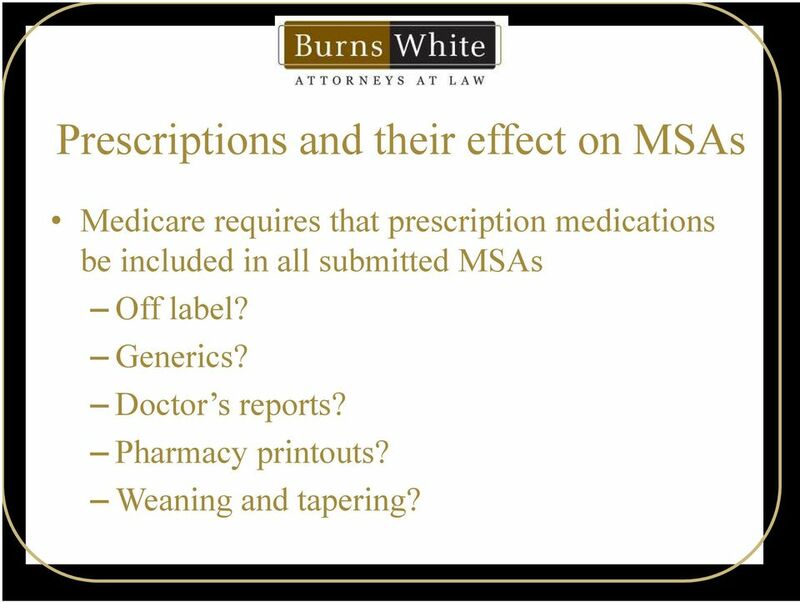 13 Prescriptions and their effect on MSAs Medicare requires that prescription medications be included in all submitted MSAs Off label? Generics? Doctor s reports? Pharmacy printouts? Weaning and tapering? 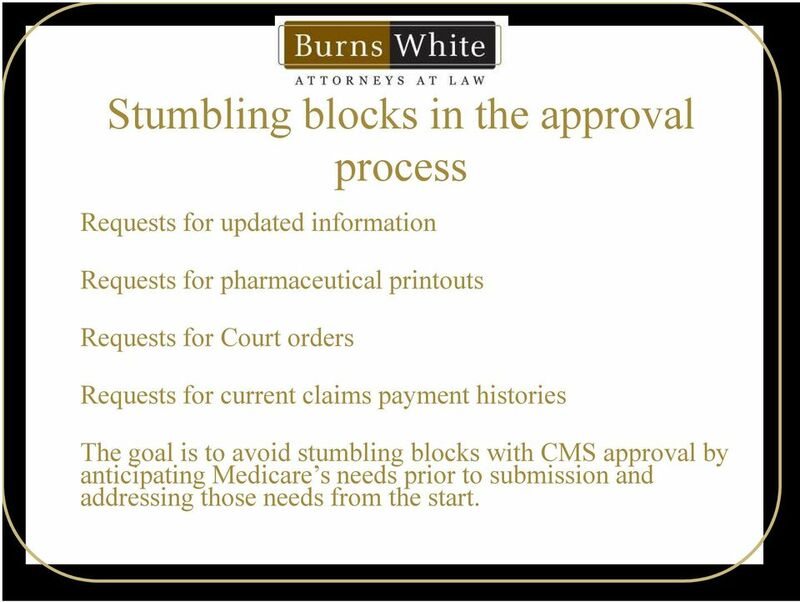 14 Stumbling blocks in the approval process Requests for updated information Requests for pharmaceutical printouts Requests for Court orders Requests for current claims payment histories The goal is to avoid stumbling blocks with CMS approval by anticipating Medicare s needs prior to submission and addressing those needs from the start. 15 What obligations exist in settlement of workers compensation claims that do not require Medicare approval? 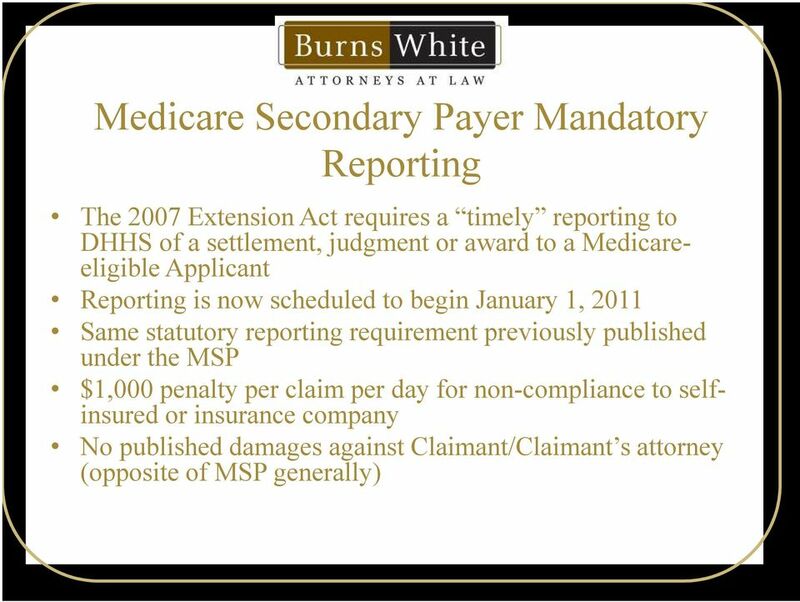 Must still consider Medicare s interest (July 11, 2005 Memo) Even if a Claimant is not yet a Medicare beneficiary, and/or does not meet the CMS thresholds for review of a MSA proposal, they must consider and protect Medicare s interest. 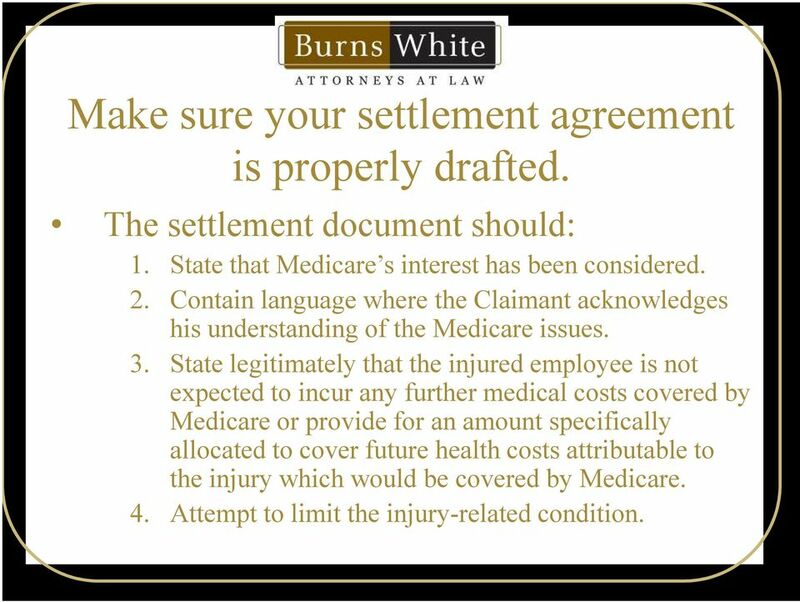 We suggest that the future Medicare-covered medical expenses related to the claim be projected and reflected in the settlement agreement even if formal approval is not required. 16 Make sure your settlement agreement is properly drafted. The settlement document should: 1. 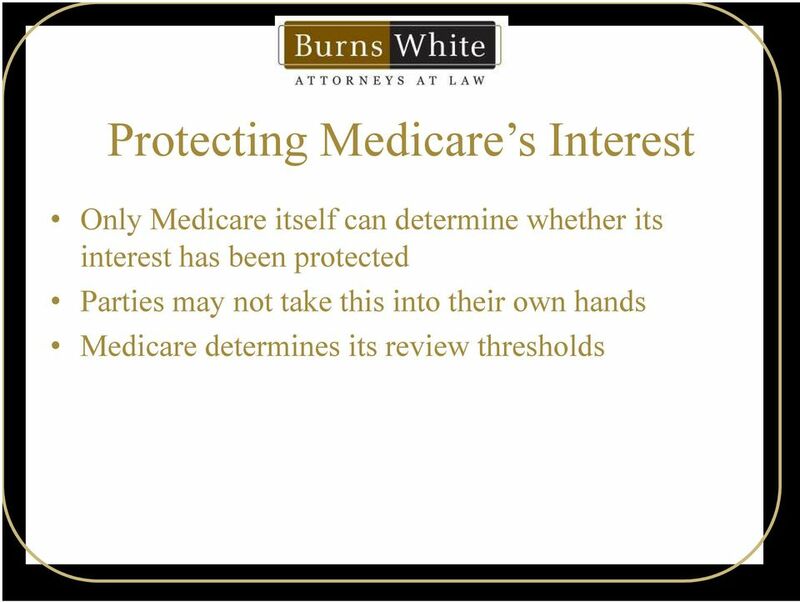 State that Medicare s interest has been considered. 2. Contain language where the Claimant acknowledges his understanding of the Medicare issues. 3. State legitimately that the injured employee is not expected to incur any further medical costs covered by Medicare or provide for an amount specifically allocated to cover future health costs attributable to the injury which would be covered by Medicare. 4. Attempt to limit the injury-related condition. 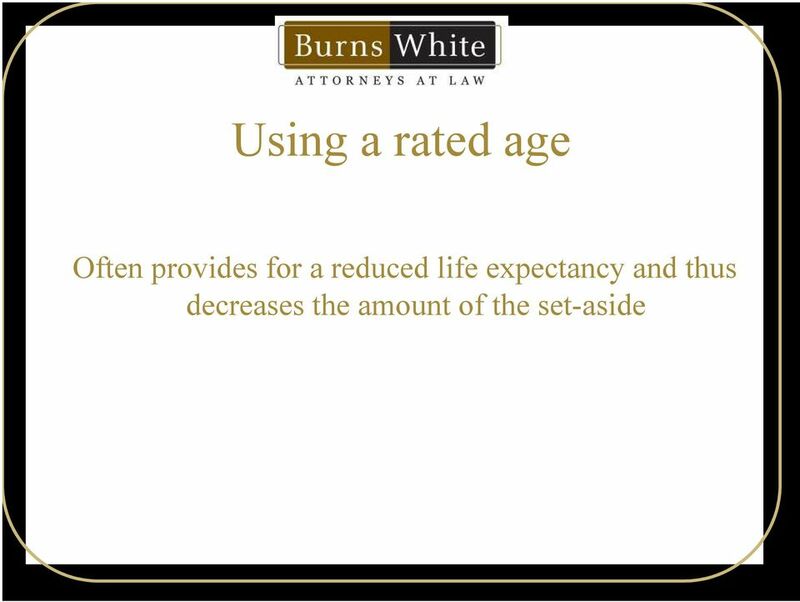 18 Using an annuity Costs of funding the set-aside can be significantly reduced. 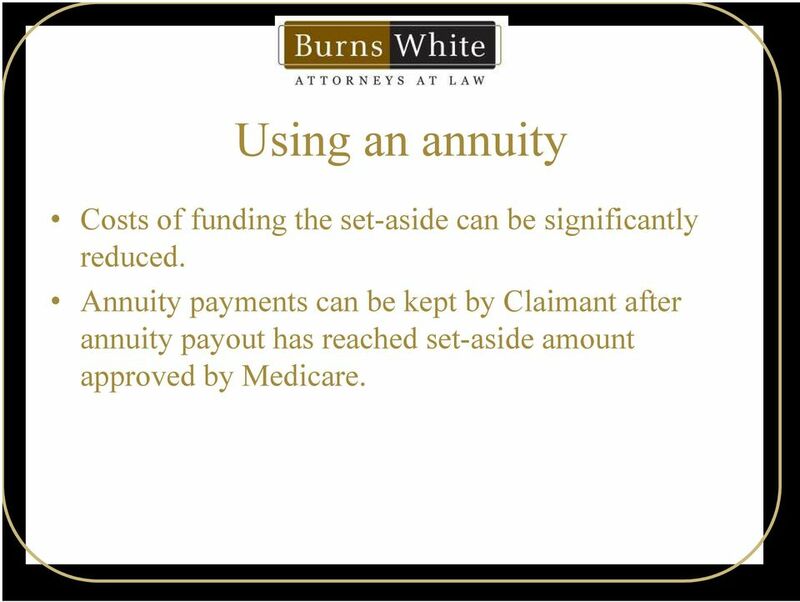 Annuity payments can be kept by Claimant after Annuity payments can be kept by Claimant after annuity payout has reached set-aside amount approved by Medicare. 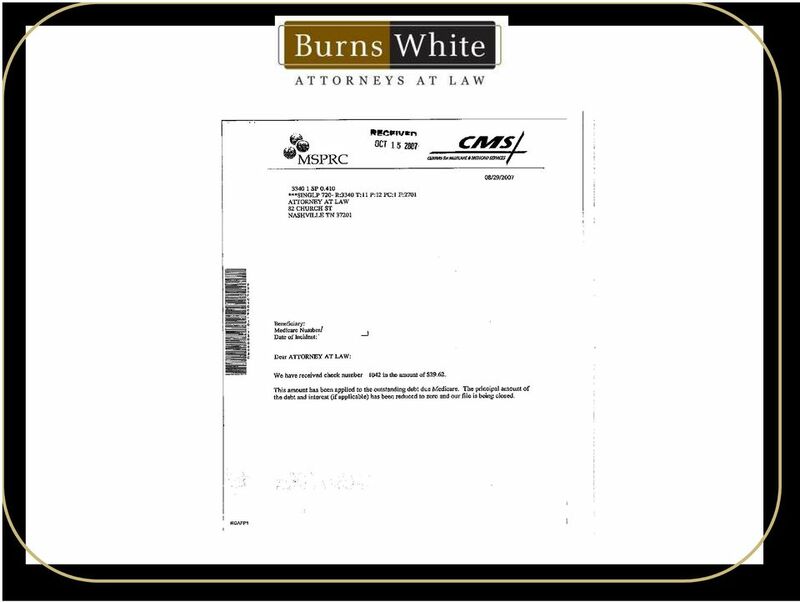 21 Can settlement be crafted to avoid CMS obligations? 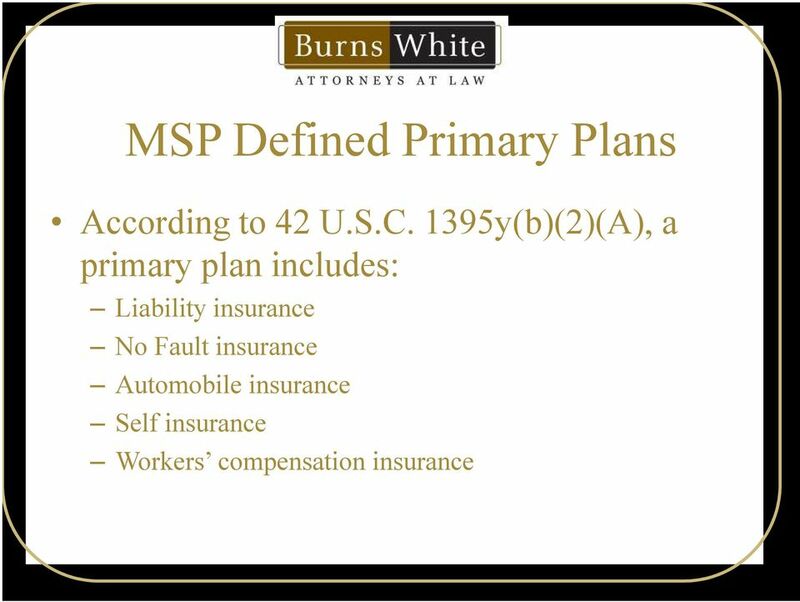 Example: Attempt to break down a workers compensation settlement for $35,000 into two (2) separate settlements for $11,000 and $24,000, in order to circumvent Medicare approval process. 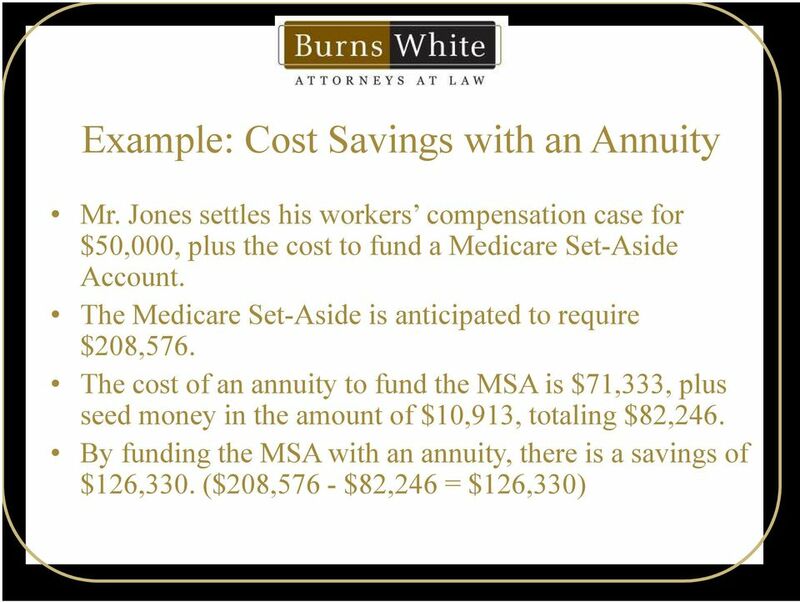 Example: Indemnity/Medical Settlement for $24,000. 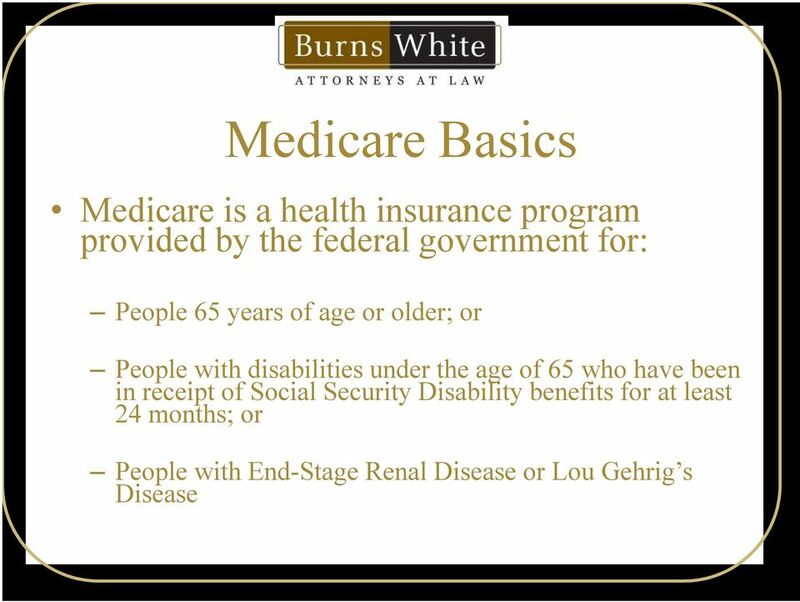 Claimant is Medicare-eligible. No need for approval?